However big or small your floor area is, no matter where the damp problem arises from, Guardian damp proofing have the experience and a solution to transform your floor into a dry and habitable area. Most of the time a cementitious tanking system can be used on problematic floors. However if the floor is constructed of wood and set on floor joists a different approach must be used to isolate and treat the origin of the damp. This kind of dampness is often caused by damp walls coming into contact with the floor at its’ edges. 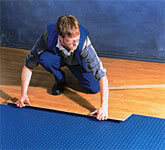 By treating the affected walls the source of the damp is eradicated and the floor is then allowed to dry out. Damp proof membrane and water vapor suppressant ‘Triton damp seal flooring system’ is a solvent free, two part epoxy resin coating, typically used as a surface damp proof membrane and a water vapor suppressant. Well suited for use as a water and water proof barrier, It is also suitable for application on damp surfaces, such as sand/cement and cement floors subject to rising damp or containing residual construction moisture. Tri-Seal can be used as a general purpose coating for surfaces subject to foot and light wheeled traffic. 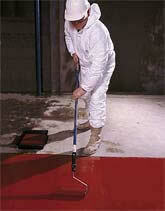 Tri-Seal is applied using a brush or medium pile roller onto sound, clean surfaces. Platon Stop provides an effective, single application damp proof underlay for wood and laminate floorsPlaton stop, underlay for damp proofing concrete floors laid on concrete. It’s equally effective for renovation or new build projects and the tough polypropylene membrane can be laid directly onto a new concrete slab as soon as it is dry enough to walk on. With three times the water vapor resistance than film membranes, it eliminates the need to install a foam underlay. Construction height is only 2.5mm. In extreme cases of penetrative damp Guardian uses Isola P20 Cavity Drain Membrane. P20 is a high capacity drainage membrane recommended for use on all floor applications below ground due to its ability to control free flowing water. The deep stud profile is designed to resist blockages caused by lime deposits. Guardian install P20 as part of a structured cavity drainage system.